Dewey's Decimators team members Aurora Martinez, Kathy Farago and Victor Rosenberg, with Reaching Heights Executive Director Krista Hawthorne, and the coveted plastic bee trophy. 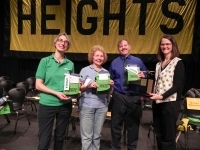 By correctly spelling “harridan,” Dewey’s Decimators, the team from the Heights Libraries—Kathy Farago, Aurora Martinez and Victor Rosenberg—became champions of the 24th annual Reaching Heights Adult Community Spelling Bee, held at Heights High on April 15. 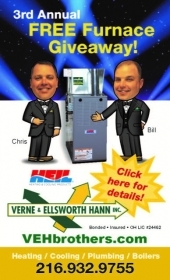 The event raised $11,000 for the nonprofit Reaching Heights. 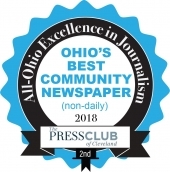 The competition was fierce, lasting into an intense eighth round with three teams still vying for the win—last year’s defending champions, the Know Nothings, representing the Heights High PTA; Upper Case, representing faculty and staff at Case Western Reserve University; and Dewey’s Decimators. The 20 teams that competed this year represented school and community groups who all contributed funds to join the event. 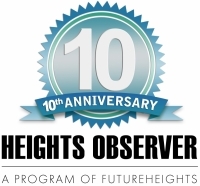 Those funds support the programs of Reaching Heights, whose mission is to mobilize community resources to foster highly valued public schools, and whose programs include elementary school tutoring, role models who speak to school groups, a program that supports families whose children have special needs, and encouragement for school music programs, and efforts to honor our school district’s teachers and other staff.